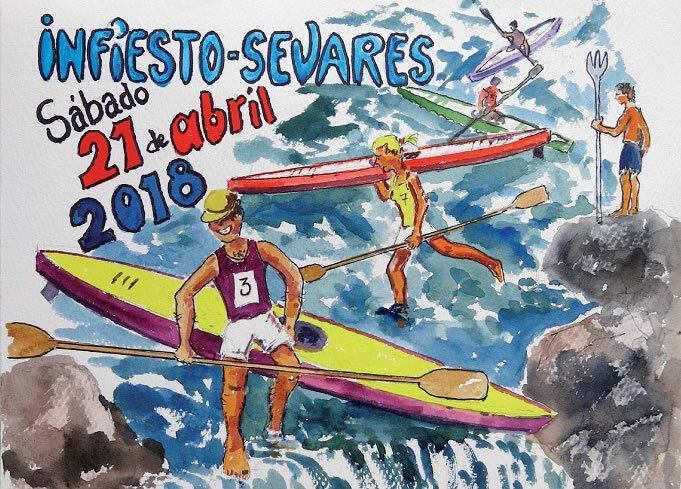 The 21 Saturday in April will be held 39th edition of the Piloña Descent. The test will leave Infiesto at 17: 00 h. preceded by the traditional parade, with the town of Sevares as its goal. 20: 00 h. Presentation of the XXXIX Descent of the Piloña River. 12: 00 h. IV Popular descent of the Piloña river. 15: 45 h. Parade for all ages, everyone can participate. Departure from the Railway Station, crossing the streets of Infiesto. 16: 55 h. The journalist Paco Grande (Journalist of TVE) will read the proclamation. 17: 00 h. Exit XXXIX Descent of the Piloña River on the Vieyu Bridge. 17: 10 h. Exit fluvial train from the stop of Infiesto, next to the Health Center. 17: 30 h. Children's animation Main Square. 18: 35 h. Departure from the Sevares river train to the Infiesto station. 20: 00 h. Award ceremony in the Plaza Mayor. Award ceremony IV Children's drawing competition organized by AMPA CEIP Infiesto. Distribution of bollu and cider to those who have acquired the bonus. *** All festive events and the fluvial train will be subject to the celebration of the sports event, conditioned by time. One response to "XXXIX Descent of the Piloña River"